Daniel Zingg of the right-wing Protestant party the Federal Democratic Union recently declared at a press conference that Islam is not just a religion but “primarily a political system that is in opposition to our legal system”. He also advanced a theory according to which the number of Muslims determines the Islamisation of society. Zingg asserted that when Muslims make up 2-3% of the population, they begin to propagate their religion. From 4-5%, they begin to exert a “disproportionate influence” by demanding, for example, halal food. And when the number becomes greater, they attempt to gain the right to govern themselves according to Sharia. However, this Islamophobic progaganda has not proved universally popular among those campaigning for a “yes” vote in the immigration referendum. 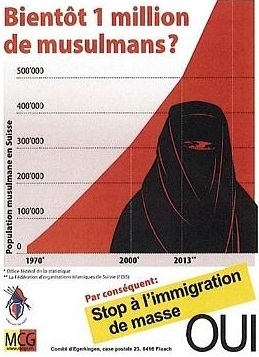 The Geneva Citizens’ Movement (Mouvement citoyens genevois – MCG) is unhappy with these developments, as one of its leading politicians, Mauro Poggia, is a convert to Islam. MCG president Roger Golay claimed that the party had never agreed that its logo should appear on the Egerkingen Committee’s anti-Muslim poster, and is campaigning for controls on immigration, not against Muslims as such. This entry was posted in Analysis & comment, Far right racists, Right wing, Switzerland by Bob Pitt. Bookmark the permalink.